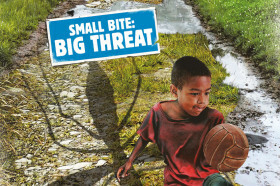 Warning that a “small bite can carry a big threat,” the United Nations family is marking World Health Day by urging the international community to back a global health agenda that gives higher priority to controlling the spread of vector-borne diseases, a step towards ensuring that no one in the 21st century would die from the bite of a mosquito or a tick. “Every year, more than 1 million people die from diseases carried by mosquitoes, flies and other insects, such as triatomine bugs. These vector-borne diseases – which include malaria, dengue, yellow fever, Japanese encephalitis, Chagas disease and leishmaniasis – cause chronic illness and immense suffering for hundreds of millions more,” says Secretary-General Ban Ki-moon in his message for the Day, which is observed every year on 7 April to mark the founding in 1948 of the UN World Health Organization (WHO). Mr. Ban says that climate change, altered habitats and increased international trade and travel are exposing more people to the vectors that transmit these diseases. They present a risk in all regions, including countries where the threat had formerly been eradicated, but the most affected are the world’s poorest people, especially those who live in remote rural communities far from health services or in urban shanty towns. “By profoundly affecting people’s health, vector-borne diseases are a serious impediment to poverty reduction and sustainable development,” he said, stressing that work to achieve the Millennium Development Goals (MDGs) and define a post-2015 development agenda must recognize that investing in vector control and disease prevention is both wise and necessary. While stressing that sustained political commitment can save millions of lives and yield substantial social and economic returns, he said that it is also important to recognize that vector control goes beyond the health sector. “Poorly planned development initiatives such as forest clearance, dam construction or irrigation to boost food production may increase the disease burden,” he explains. By tackling such issues through an integrated, coherent and united effort across many sectors, including environment, agriculture, water and sanitation, urban planning and education, this serious but eminently preventable threat could be effectively controlled. “On this World Health Day, I urge countries and development partners to make vector control a priority,” declared the Secretary-General. For its part, WHO is highlighting the serious and increasing threat of vector-borne diseases, with the slogan: “Small bite, big threat” . The agency’s newly published global brief on vector-borne diseases outlines steps that governments, community groups and families can all take to protect people from infection. Echoing the Secretary-General’s concerns, WHO stresses that environmental changes, a massive increase in international travel and trade, changes in agricultural practices and rapid unplanned urbanization are causing an increase in the number and spread of many vectors worldwide and making new groups of people, notably tourists and business travellers, vulnerable. Mosquito-borne dengue, for example, is now found in 100 countries, putting more than 2.5 billion people – over 40 per cent of the world’s population – at risk. Dengue has recently been reported in China, Portugal and the state of Florida, in the United States, WHO says. With these concerns in mind, Dr. Jacob Kumaresan, Executive Director of WHO’s New York Office, offers some simple steps than can protect people, their families and the environment – get vaccinated, use insect repellent, sleep under an insecticide-treated bed net, wear light-colored, long-sleeved shirts and trousers, install window screens and get rid of stagnant water from places where mosquitoes breed, such as old containers, flower pots and used tires.